As if there was any remaining doubt, the past few weeks have shown that US President Donald Trump is fully committed to demolishing the American-led post-war order and free-trade system. Europeans no longer have any time to waste: The EU must assert itself as a unitary, self-sufficient global power before it is too late. BERLIN – After US President Donald Trump’s recent European tour – which culminated in his infamous press conference with Russian President Vladimir Putin – there can no longer be any doubt that he and his supporters want to destroy the American-led international order and global trade system. By seeking to disrupt virtually all that has defined the West since the end of World War II, Trump has brought the world to a historical turning point. At stake is not the US-EU relationship, which remains strong, but rather the West’s dominant position on the world stage. Trump is accelerating a shift in the global balance of power that will leave both America and Europe weaker in relative terms. As income and wealth shift from the West to the East, China will increasingly be able to challenge the US as the world’s leading geopolitical, economic, and technological power. This transition will not happen smoothly. For Europe, the stakes could not be higher. The rebalancing of power that is already underway could determine the fate of Europe’s democracies, welfare states, independence, and way of life. If Europe does not prepare itself, it will be left with no other choice than to become a dependent of either America or China – Atlanticism or Eurasianism. Europeans should not count on existing alliances and rules to offer much protection during this period. But nor can we fall back on the logic of traditional nineteenth-century power politics. The world may well be heading toward a situation in which there is no clear hegemon, and great powers constantly jostle for position. But circumstances today are very different from those of the “Great Game” era. An escalating rivalry between China and America will be anything but advantageous for the Old Continent. For Europeans, the nineteenth century was shaped by the aftermath of the French Revolution and the Industrial Revolution, whereas the twentieth century was driven by two world wars, the Cold War, and the development of nuclear weapons. At the end of WWII, two non-European powers on either side of the old European state system – the US and the Soviet Union – asserted themselves, and Europe became just another square on the chess board. Up to that time, Europe had ruled the world, owing largely to its technological prowess. But with the end of WWII, its dominance came to an end. Europe – and particularly Germany – was thereafter divided between the two new powers, and European sovereignty was effectively subsumed by the US foreign-policy establishment and the Kremlin. To be sure, France and Great Britain, as the two victorious European powers, retained a remnant of sovereignty as permanent members of the United Nations Security Council (and later as nuclear-armed states). But, given the global balance of power, this was more symbolic than a reflection of their real influence. Then came the end of the Cold War, when all of Europe adopted a staunch transatlantic orientation. In terms of security, Europe remained dependent on the US. But on the economic and technological fronts, Europeans had regained their sovereignty. Institutionally, this division of labor was manifested in NATO and the EU, respectively. It is an arrangement that has served us well; but it is now under attack by Trump. Three developments, in particular, have given Europe reason to fear for its future. First, Trump has continued to question the US commitment to mutual defense under the North Atlantic Treaty. Second, his administration is actively undermining the World Trade Organization and the global trade system upon which much of Europe’s prosperity rests. And third, the rise of digitization and artificial intelligence now threatens to upend global technological hierarchies. These developments are each challenging Europe’s place in the world. 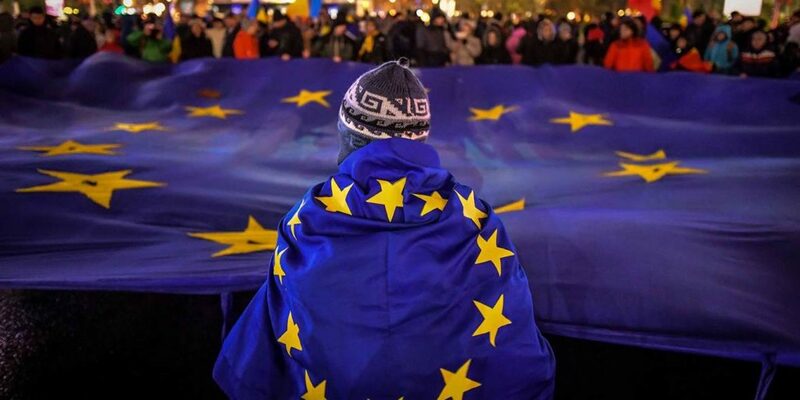 The question now is whether the EU will reclaim its full sovereignty and assert itself as a power on the global stage,or let itself fall behind for good. This is the moment of truth. There will be no second chances. Only the EU can win back European sovereignty for the twenty-first century. If the task falls to traditional nation-states such as the United Kingdom, France, and Germany, it will fail. Reclaiming sovereignty will require not just enormous effort, but also a united front, and a new understanding of the relationship between the EU and its member states. The European project will continue to facilitate trade and ensure peace; but it must now also enshrine joint sovereignty. If the EU succeeds in this task, Trump will have inadvertently done it a big favor. History sometimes proceeds in strange ways. The key is to take it as it comes, and not hesitate when the moment for decisive action arrives.